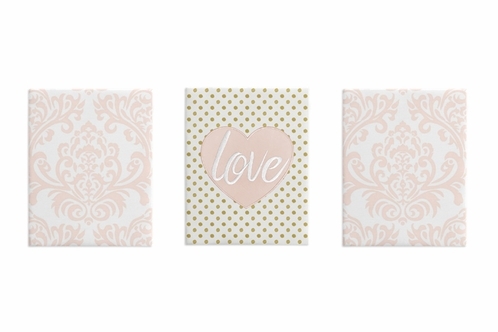 Sweet Jojo Designs 3 piece wall art sets are perfect for adding a stylish look to your bedroom, playroom, or nursery. Each piece is made from a sturdy frame wrapped in fabric and features Sweet Jojo Designs custom prints, embroidery works, and appliques. These works of art are sure to complete the look of your room. 3 pc. Wall Art Set- Each individual piece measures 11in. x 14in. x .5in. Decorative wall art set features damask fabrics and a heart on a polka dot background with an inspirational �Love� embroidered quote. Each panel comes ready to hang with no installation required. Love the fabric style? Sweet Jojo Designs also makes coordinating bedding and d�cor accessories.